Designed by Pamela Byrd Smith. Copyright of The Prairie Schooler. 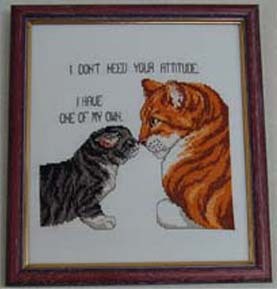 From "Cattitudes - The Tenth Litter"
Copyright of Jeanette Crews Designs. 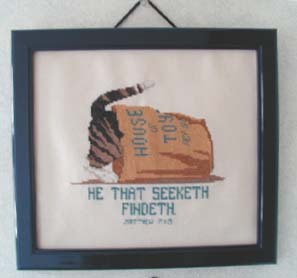 My mother asked me to make a sweet cat work for her house. So I selected this design and finished. I do think she loves it ! 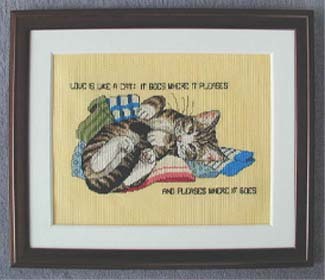 From "Cattitudes - The Eighth Litter"
When I was stitching this, there were a few sad news. One of my cats Poh was suffering with pneumonia. medical treatments every single day. We spent a very hard time. And another was - my friend's kitten died. The kitten was just like this and too small. So, thinking of Poh & him, I stitched it. Hope he'll be born again, next time to be happy with a long life. About Poh, she has recovered 100% ! From "Cattitudes - The Sixth Litter"
From "Cattitudes - The Second Litter"
After I finished this, I regretted about the fabric colour. according to the project information .. Copyright © ぱたにゃん＠stitch. all rights reserved.